Russia is a northern country of Eurasia. It is one of the fascinating places of the world. The tourist comes here from the different corners of the world to visit the sights of Russia. Especially the excellence of the garden attracts the tourists. 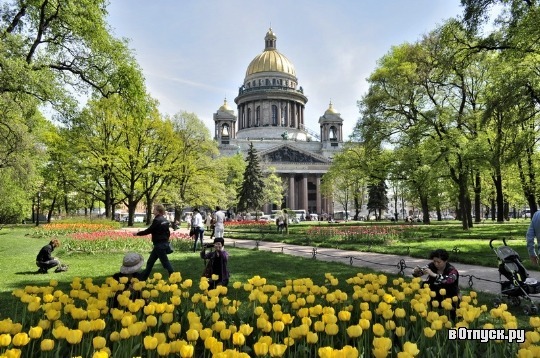 Here is a list of five most famous gardens in Russian Federation. The garden is located at the heart of St. Petersburg. Once upon a time, the place was occupied with admiralty’s fortifications. At the beginning of the 19th century, An Avenue has been set up in front of the Admiralty. After that, the place has been turning out into fashionable place in no time. The place is decorated with various relics of Russian. The Garden was first set up in the presence of Alexander II in 1874. It has been named according to Alexander II. In the garden, there are lots of naked statues which attract the concentration of spectators. It is one of the revamped gardens. It is too much lovely and an excellent one. It is the chief source of the flower power. The different types of flowers are available. The garden is established in 1706. The garden is used to grow herb and medicinal plants so later; the garden has been named as a pharmacy garden. Visitors come from different places in the garden. There are some ornamental plants in the garden. The Aptekarsky Ogorod is used for concerts, craft fair and fashions show. It was the oldest botanical garden. The Aptekarsky indicates the apothecary in the Russian. Now the garden belongs to Moscow State University. Spasskoye-Lutovinovo was the state of Ivan Turgenev. Once upon a time, the state was suppressed with the Soviet rule. Later, it has been opened as a museum in the 1970s. The whole garden is covered with green tree. There are also huge ponds. The area is famous for its architecture. The whole area is excellent enough that the tourist comes from the different places. The garden has been named after the Victoria. When the Victoria was winner over Napoleon in the great patriotic war. The place is also used to exhibit the outdoor exhibition. The garden is well designed and well maintained, so the tourist is an impressive too much-having place. The tourist from all over the world comes here and takes a photograph. Besides, there are many restaurants emerged around the victory garden. The garden is attractive because of different trees. It is one of the famous gardens widely known world widely. It is suited behind the Tarried Palace. The starting time of the garden is 1783. The landscape of the garden is awesome. It is a picaresque. Each sight of the garden is awesome. The area is fulfilled with the canal, ponds, and landscape. The area has been opened 1866. After that, the garden has been popular publically. There are also available different sports area. Russia is fulfilled with beauty. All the garden has well known for its history. If you are interested in visit garden and the most attractive places of the world, you can list the garden of the Russia. These are the most attractive place in the world. Most of the garden is under construction. As the garden was aged enough, now they have been worn out, so most of the parts of the garden are under construction. There are lots of statue and ultra-modern garden furniture are being included here day after day. It is expected that the Russian garden will be more spectators to the people of the world and the number of the visitors from all over the world will come here to spend their leisure time. Nature is giving lots of thing to the world. On the other hand, the people of the word are contributing and gifting the nature many unique and craftily designed equipment to make the garden more loveable to the human. Every day, the world is adding lots of items to the gardening items and makes the environment more attractive and loveable. If you want to have the details. You can see from http://gardenkoo.com. The site has packed a lots of unique item of garden furniture.